Hotels in La Garde-Freinet (France). Set in a 4000 m² park in the heart of the Maures Mountains, this guesthouse offers an outdoor swimming pool with a fully furnished terrace. Each room and studio at the B&B Lei Bancaou has a modern décor and views over the garden. They have a private bathroom with luxury products, and some rooms have free Wi-Fi access. A continental breakfast is served daily in the dining area or out on the terrace overlooking the garden. Free private parking is provided. This bed and breakfast is 7 km from Grimaud, 15 km from St Tropez and 18 km from Ramatuelle and Pampelonne Beach. Located in the heart of the Massif des Maures Mountains, La mouchelière sits in a garden with outdoor swimming pool and sun loungers. Free Wi-Fi and free private parking are provided on site. La mouchelière offers guest rooms with a private bathroom fitted with shower and a TV. Guests will enjoy a terrace with views of the village, a private entrance and a coffee machine. Guests can stay in a studio with mezzanine, bathroom with shower, TV with satellite channels and terrace with village views. There is also a washing machine. A continental breakfast with pastries, bread and a range of hot drinks is offered to guests staying in the guest rooms. The studio is self-catering and has a kitchen equipped with oven, microwave and stove. Restaurants and shops can be found 800 metres away in the village. Guests can drive 22 km to visit Saint-Tropez. 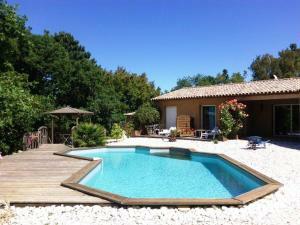 Les Arcs Draguignan Train Station is 24 km away and Saint-Raphaël train station is 27 km away. 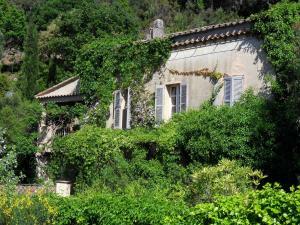 Set on a 2-hectare garden with trees, Résidence Le Mouron Rouge is 1 km from the centre of La Garde-Freinet. It offers an outdoor swimming pool, free Wi-Fi access and a private terrace with sunbeds. All non-smoking accommodation types at Résidence Le Mouron Rouge offer air conditioning, garden views, an Ipod docking station and a flat-screen TV with satellite channels. A private bathroom with free toiletries and a shower is also available. A continental breakfast is served every morning at Résidence Le Mouron Rouge and guests can enjoy it in the comfort of their rooms. The apartment and the studio feature a fully equipped kitchen with kitchenware, an oven and a refrigerator. This guest house is 13 km from the coast and 15 km from Saint-Tropez. Free private parking is available on site and Grimaud is situated 9 km away. 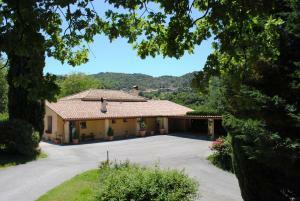 Located in La Garde-Freinet, Pastorale offers an outdoor pool. This self-catering accommodation features free WiFi. The villa will provide you with a TV, a terrace and a seating area. There is a full kitchen with a dishwasher and a microwave. The private bathroom comes with a bath or shower. You can enjoy pool view and garden view from the room. At Pastorale you will find a garden, barbecue facilities and a terrace. The property offers free parking. Nice Côte d'Azur Airport is located 71 km from the property. 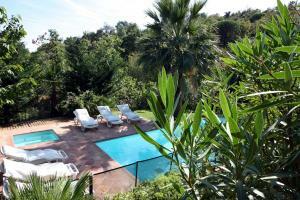 Quietly located in the Forêt des Maures forest at La Garde-Freinet, Gîte Maison d'Allouma has a shared outdoor pool. Built in traditional style and dating from the 18th century, it offers split-level accommodation set amidst a garden. Free Wi-Fi is available in all areas. Featuring beamed ceiling and warm tones, Allouma opens on to a terrace. A flat-screen TV with CD/DVD player are available in the living room. A fully-equipped kitchen and a dining area are also provided. Featuring a shower, the private bathroom also comes with a hairdryer and free toiletries. Guest can enjoy table tennis and boules on site. Beauvallon Beach lies within 10 minutes by car, while Grimaud village can be reached in 8 km. Plan de la Tour et La Garde-Freinet centre are 8 km away. The property is a 30-minute drive to Saint-Tropez. Free private parking is provided on site.